This Saturday is the last stop of the first Old Guy Jam Series of 2012. The contest was organized in March 2012 by Heidi Lemmon (SPAUSA), Jeff Greenwood (Concrete Disciple), with the help of earl, yoshi and gnarson. 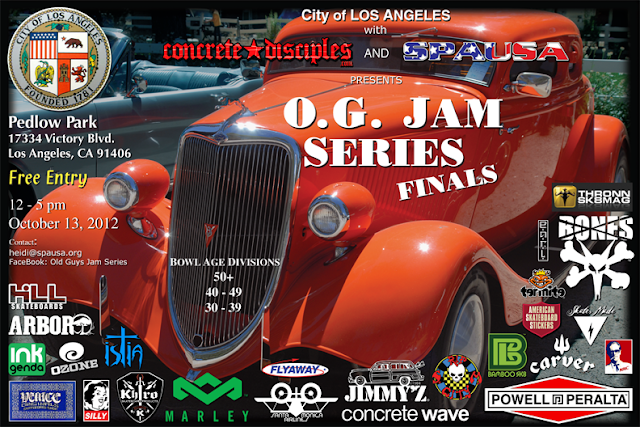 The idea behind the OG Skate Jam was to organize a contest for old school riders over 30 years old with a minimum budget and it was a real success. 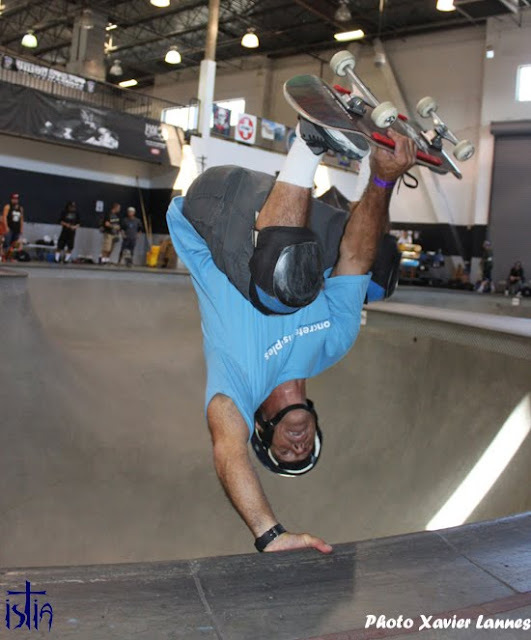 The series started at Pedlow, followed at Skatelab, The Cove, Etnies and the last stop will return at Pedlow skatepark (in Van Nuys) on October 13th. Eddie Hadvina has clinched the over 50 Division by winning each and every stop. Not only he was unbeatable but he is sure to win the 2012 series. The other 2 men’s divisions are not quite settled so there will be a show down. OG 5 and the Championship is set for Oct 13 at Pedlow park starting at noon. The OG Skate Jam series will award winners thru 4th place, as usual, then tally points and announce winners for complete series. Gold, Silver & Bronze medals thru 3rd place in each division and the overall winner of the series. Earl designed the medal and flyer for this last stop. This Thursday night, Steve Wright has generously volunteered to bring out his lights set up to light up the bowl after dark. This means a practice session from dark until maybe 10 o'clock. Keep your eye on the weather forecast as there is currently a change of rain!